This is a post written on Tumblr by an elementary school music teacher. I keep picturing it in my head and it gets funnier every time! So, I'm a music teacher and every year we have what are called "walk through observations". Basically, this means that 4 times a year the principal or vice principal comes into my class to assess my teaching. Fine. Sure. No problem. Well, today I was doing an activity with my 1st graders called "Musical Groceries". Basically, they make up a fake shopping list and then together we figure out what the rhythm of the words on the list is. To do that, a small group of students plays the beat on the conga drum while the rest of the students move around the room while chanting the word. It sounds weird but it's a great way for the kids to figure out the relationship between syllables and rhythm. They quickly get bored of walking the rhythm so I let them come up with their own ways of moving around the room. ( skipping, hopping, etc) One student suggested they hop around the room like frogs, way down low to the ground. Okay fine. Or it was fine until my vice principal walked in to do my observation only to find 20 seven year olds hopping around the room like a hoard of little hob-goblins, rhythmically chanting "BREAD! BREAD! 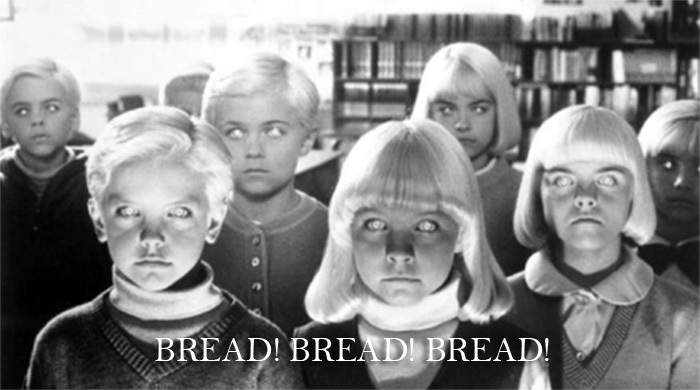 BREAD!" while five other kids played ominous beats in a drum circle. I have never seen anyone look so confused in my life and I really don't want to know the rating I got on my observation. Hahahahaha sounds like me and my daughter when we get on a nutty mad half hour.